We’ve said it before but we’ll say it again, innovation really is a U-shaped process. In other words it’s fun at the start when you are having ideas and meeting new people. And it’s fun at the end when you are launching new products or services and creating new commercial or social value. However it’s generally pretty terrible in the middle when you have different people with different opinions about what to do, motivated by different things, and still just a fragile proposition that still need nurturing. I’ve often wondered what that mid point is actually called when it arrives, which it always does? My sense is if we can name it we can help people plan for it and avoid at least some of the anxiety that comes with it. So in the absence of any better ideas* I’m going to suggest “The Chasm of Complexity” – the scary point at which you either defeated, retreat, or jump to the other side. Instinct – In the absense of any other indications, it’s important to listen to what is your gut telling you? Momentum – Try to move as quickly as possible, and set challenging deadlines, which galvanised particiation. Courage – Ultimately innovation is about being brave and taking a leap into the unknown. 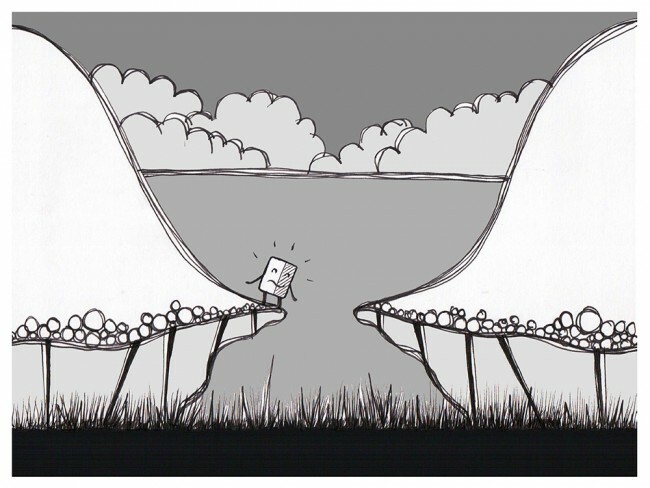 Faith – You need to trust your project or partner enough to jump (or climb out of) the chasm collectively. Determination – Just keep on keeping on – working the work. Dogged determination goes a long old way. Compassion – There will always be mistakes (in hindsight) so it’s best to try to avoid the blame game and celebrate success together instead. If you can coral all of those factors, then you might just have a chance of getting through to the other side. Where are we trying to get to? What is our vision and our end goal? Does this decision take us closer to our destination or not? If so, why to we believe this to be the case? Is there some data we can point to or is it gut instinct? Either way, do we all agree this is the right way forward at this point? If not, does anybody have any better suggestions right now? If not, are we willing to give this a go until we learn more? As always we’d be interested in your experience of crossing the chasm of complexity, and any other suggestions for better names, and also any tactics you have for getting to the other side. * The bottom of the U bears many resemblances to the Valley of Death talked of frequently in tech start-up circles and the Gartner Trough of Disillusionment in reference to new technology memes. Also whilst writing this post I asked people on social media for alternative name suggestions and here is a summary of my favourite responses so far: “The Bends” from Ian Makgill, “The Deflection Point” from Michael Fruhling, “The Glen of Hesitation” from David Townson, “The End of the Beginning” from Matt Schofield, “The Frustration Zenith” by Samad Masood, “The Murky Middle” by Ladina Brown, “The Dread End” from Niall Smith, and “Work!” from David Basnett.